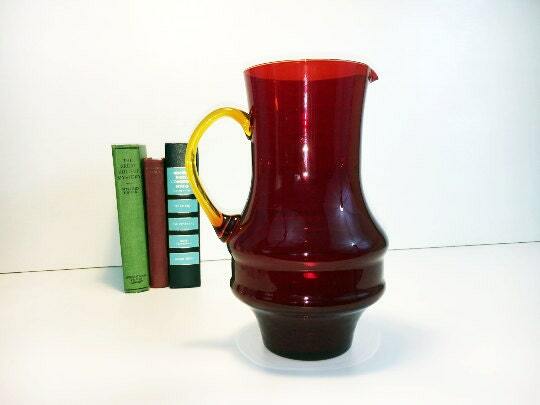 Vintage Amberina Art Glass pitcher is a possible Blenko or Viking art glass piece from the mid century. 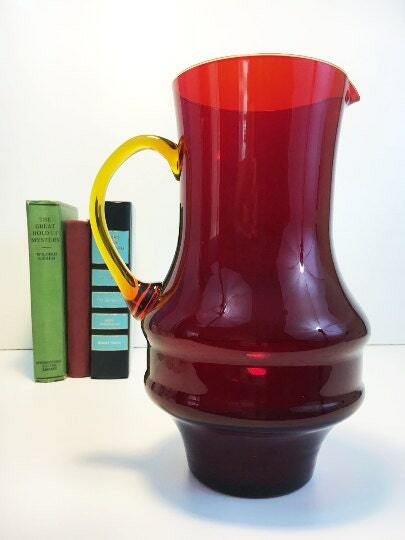 This bright and eye-catching art glass pitcher is bright and beautiful. 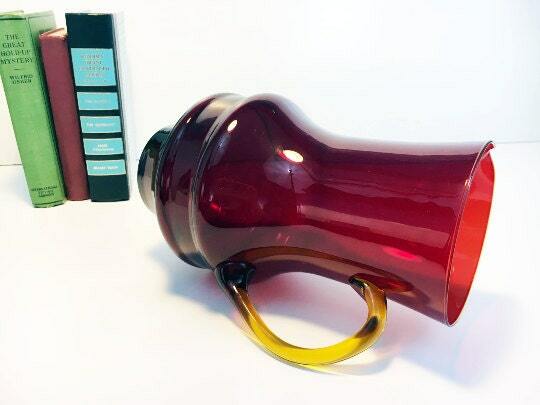 The body itself is completely red glass with a yellow ombré handle. 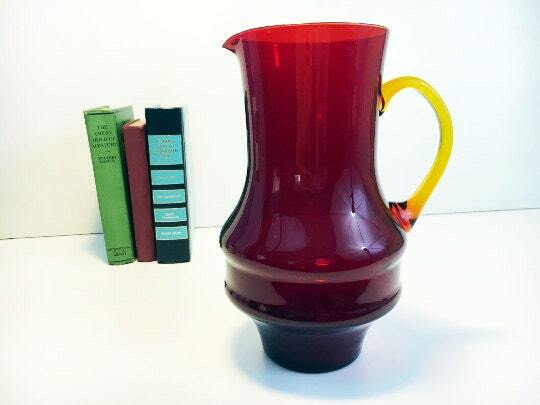 The top of the handle is yellow, transitioning to red where it connects closer to the body of the pitcher. 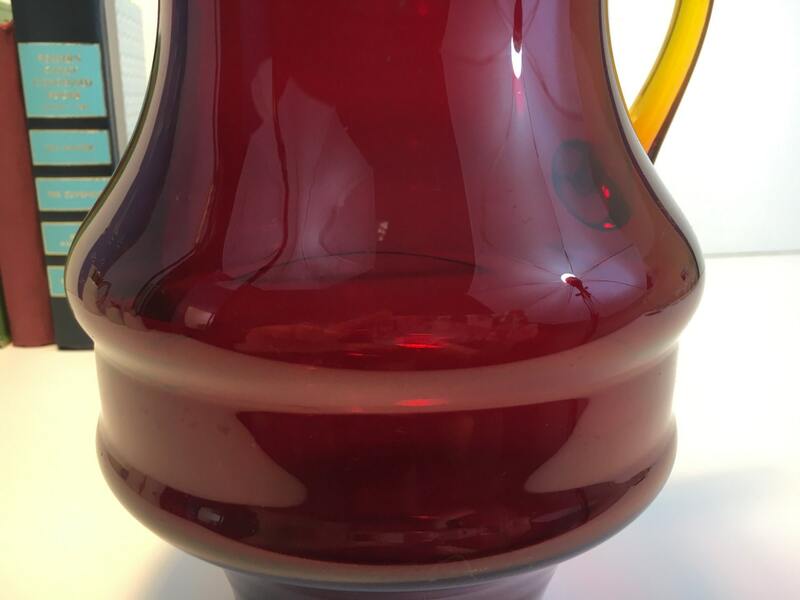 There is also different shape to the bottom of the pitcher with different bands - see close up photos. Both the color and shape are what make this piece unique. The glass is hand blown as evidenced by the bubbles in the glass in various places and designs that come with hand blown pieces (on one portion of the glass it looks like there is a small line design going through the glass). The pitcher is approx. 10" tall. The bottom is 3 1/4" across and the top is approx. 4 1/2" across. Glass is heavy/thick glass closer to the bottom (more delicate at the top). In very good vintage condition with no chips or cracks. Some wear on bottom consistent with vintage age which is circa 1970s to 1980s. One light scratch - see close up photo. Great home decor item from the mid century!